So for the Green & Black's 15:15 Challenge ("use a budget of £15 to make a dish in 15 minutes"), I decided on an old faithful - Japanese aka Wafu Pasuta. As I said this was for two reasons - it's easy as pie to throw together, and it captures all five of the tastes Sweet, Sour, Salty, Bitter and Umami aka Savoury. I had no set recipe in mind, and just wanted to find ingredients that complement and contrast each other - so before turning up to the challenge, I went to the Japan Centre on Lower Regent Street to see what appealed. I considered umeboshi, a type of pickled Japanese apricot, for the sour element; katsuobushi hanakatsuo, the flakes of bonito that dance about madly on top of okonimyaki pancakes, for the savoury; and strips of nori seaweed for the salt. Eventually, I went for buna-shimeji mushrooms, dashi, mirin wine, soy, ikura, shiso leaves and negi onion, and handed over my £15 (ikura particularly is a pricey treat, though worth every penny. Slice a half-inch off the bottom of the mushroom clump and discard this piece. 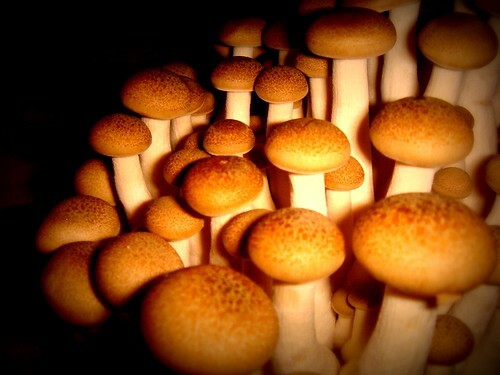 Break the mushrooms into small clusters. Roll the shiso leaves into a "cigar" and shred finely. Shred the spring onion as well. Heat the oil in a frying pan and sear the mushroom clusters till they brown and crisp slightly on one side only. Add the soy sauce, dashi, mirin and 2 tbsp of the pasta cooking water and sizzle for another couple of minutes. 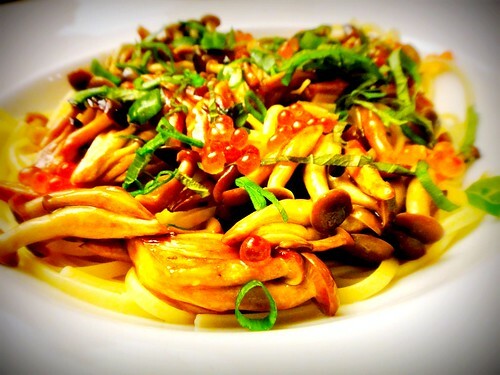 Drain the pasta, chuck the mushrooms and their sauce on top, scatter with the salmon roe and the shredded shiso and spring onions. Serve. So as you know, I won the 15:15 Challenge and the Chocolate Taste Test so was rewarded with a beautiful red KitchenAid mixer and also a set of Kyle Cathie books. 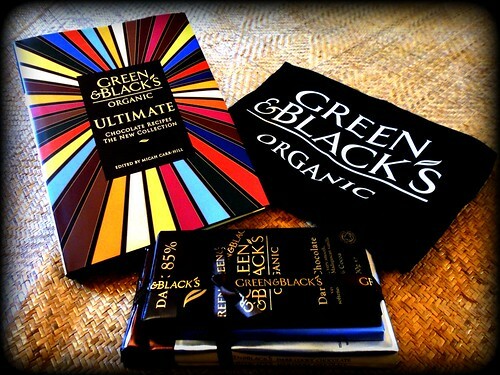 One of the books was the new Green & Black's Ultimate Cookbook which I already owned, so I thought I'd spread the love and run a little competition to win the book and some other chocolate prizes. Edited by Micar Carr-Hill their Head of Taste, "Ultimate" has recipes for cakes and cookies, cupcakes and cheescakes, puddings and pies, ice creams and even sweets. Contributors include Micah, as well as chefs such as Jose Pizarro, Allegra McEvedy, Omar Allibhoy, and Gizzi Erskine, and top blogger The Ginger Gourmand. For more on just how fab this book is, see the post by The Catty Life. To win this glamourous prize, answer the following question in a comment below. 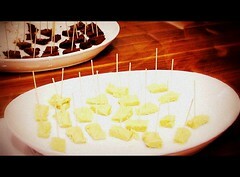 Q: Is white chocolate chocolate? Answer using science, pseudo-science, flippancy or humour, and leave your twitter name or email address in the body of the comment. Closing date for entries is midday on Monday 29 November - UK ENTRANTS ONLY (sorry!). I'll pick a winner randomly. Green & Black's are looking for an Assistant for their Head of Taste, Micah Carr-Hill. That's right - they're hiring a Chocolate Taster, possibly the BEST. JOB. IN. THE. WORLD. 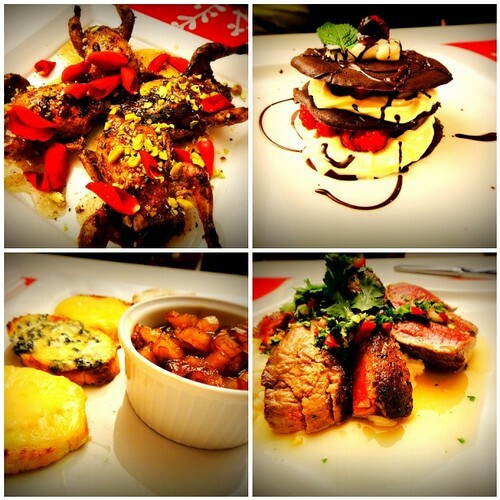 "Do you plan what you are going to cook and eat several meals in advance? 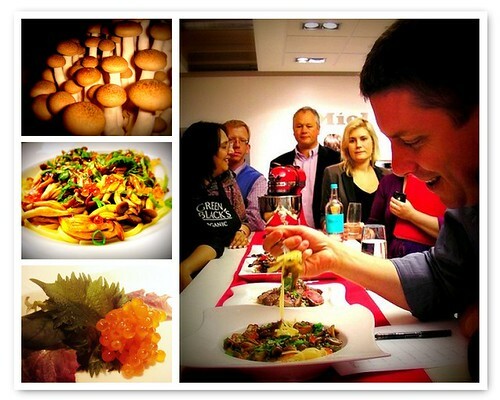 Does the science and technology of food excite you? Can you discern between acceptable tastes and excellent ones? 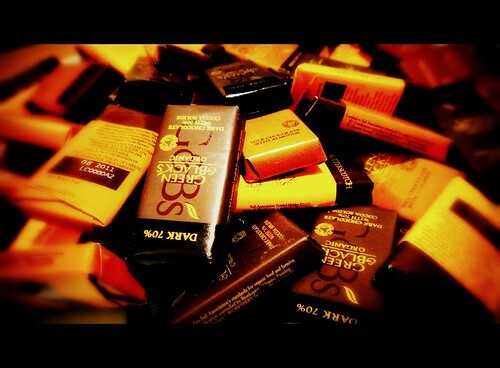 Do you love chocolate? Do you want the opportunity to build a career doing what you love? 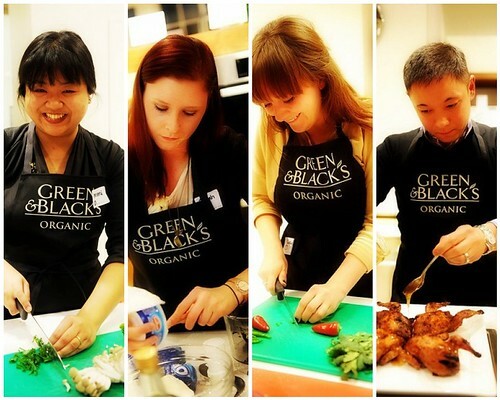 Green & Black's is looking for an assistant to the Head of Taste". 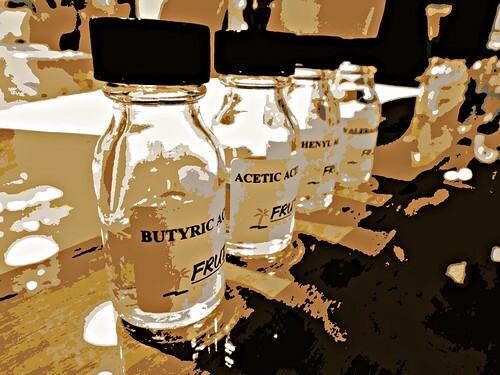 Successful applicants will be asked to undertake a series of tests, and some of us blogging folk have been invited to take part in an event to recreate a number of these tests. The venue is the Miele Showroom in London - the last time I was here had been interesting to say the least - but I'm very happy to return to play with all the fab equipment again. Micah Carr-Hill, the boss of the future Taste Assistant, welcomes us to the event and explains what he's looking for and why we're all there. I ponder whether his tongue is insured for £1,000,000 in the same way that Beyonce's bottom is. We're then given a short talk by flavourist Matthew Stokes from Fruitarom about different flavourings that are present and used in chocolate, both artificial and natural, and urged to sniff testers dipped in vanillin (nice) and butyric acid (nasty - described by Simon and Edd Kimber as "baby sick" and "cheesy socks" and indeed it reminds us of the rankest Hershey bar). Two Taste Tests which everyone can enter - the Cocktail Test by Johan Svensson from Drinks Fusion, and the Chocolate Taste Test by Micah himself. The 15:15 Challenge that nine of us have signed up for - to cook a meal for Micah in 15 minutes with a budget of £15 that will show that we understand how to balance flavours. I've thought long and hard about what dish I'm going to create in those 15 minutes - the last time I did a cook-off I'd barely produced two courses in one hour, and the time before that I'd managed one dish in 30 minutes. To be fair, both occasions were somewhat trying - this time around the atmosphere is extremely convivial and of course the fantastic Miele Home Ecs are on hand as always. But 15 minutes go by very quickly. In the end, I decide to make a version of Wafu Pasta for two reasons - firstly it's incredibly quick to throw together, and secondly it encapsulates all five of the tastes - Sweet, Sour, Salty, Bitter and Umami aka Savoury - and this challenge is all about flavour. I choose brown beech mushrooms for their sweet earthiness, dashi and soy for savouriness, salmon roe for a burst of saltiness, shiso leaves for their bitter citrussy quality and some spring onions for extra tang. There's also mirin to ramp up the sweetness and zest of the dish. With a packet of linguine, my basket comes to just under £15. Phew. 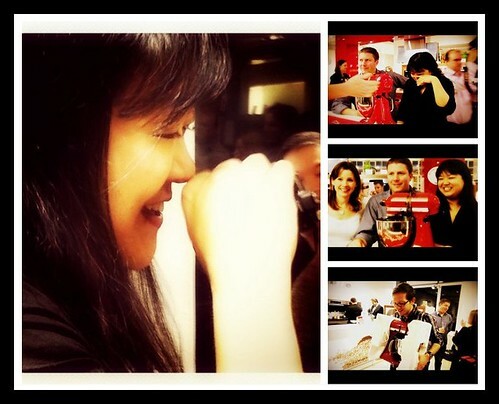 Back in the Miele showroom, the lovely Gail Haslam, community manager for Green & Black's begins the countdown. There's no time to think - we just have to cook. 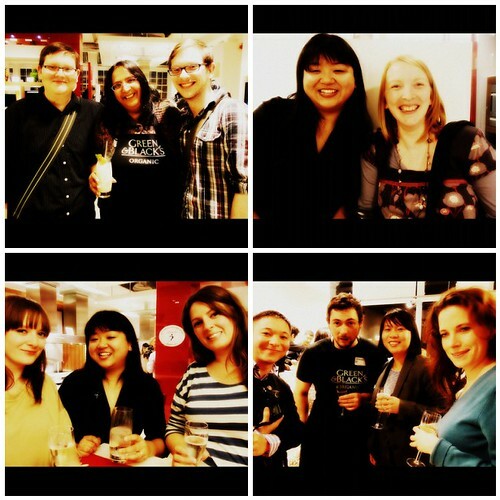 Me, Jen from Chocolate Ecstasy Tours, Laura from Feast on Scraps, Luiz aka The London Foodie,and Kavita from Kavey Eats are in this first flurry. 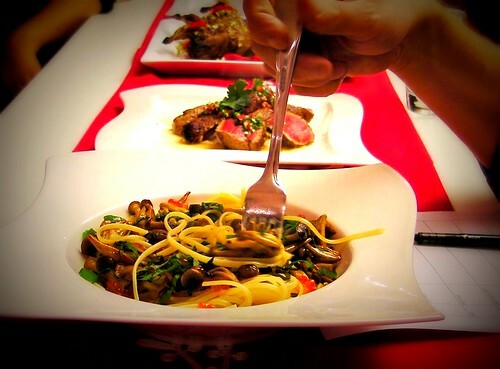 Much, much too soon, it's time to plate up and we rush forward to present them for tasting. I'm completely happy with the flavours of my dish, though concerned the pasta may be a little undercooked, and I'm even rather pleased at the way it looks, since presentation isn't my strong point. Pleased that is, until I spot quite how beautiful the other offerings are. Micah tries each dish one by one. His face is inscrutable; he makes no comments; this man would clean up at poker. He makes copious notes, and takes sips of water to cleanse his palate. When he's done, Micah leaves the table and we all set to, demolishing the leftovers. It's all stunning, though my favourites are Laura's beef dish (amazing that she cooked the coconut rice perfectly in that time) and Luiz's tender quail. Sated, I distract myself from feeling like I'm waiting for exam results by turning to the other tests and tasting the cocktails and the chocolate ganaches to try to discern the flavours. 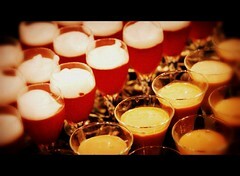 One drink is a pale pink cocktail which tastes like Parma Violets, creme de cassis and egg-white to me. The other is muddy brown and tastes of chocolate and some strong bitter, sharp booze that I can't identify. I'm on safer ground with the ganache - the dark chocolate one reminds me of Hoegaarden for some reason - citrus and spice, so I put down orange and chilli pepper as the flavours - and the white ganache tastes like green tea, lemon and vanilla - I go back for thirds of that one, even though I'm not usually keen on white chocolate. Meanwhile, the second group of contestants have started to cook - both Jack and Sarah from Food For Think, Becci from Feed & Gastro, and Simon from Fernandez & Leluu. 15 minutes later we have an elegant dish of scallops and capers (a witty variation of the MasterChef classic which makes me smile), a lush cheesecake, beautiful fresh crab linguine and, astonishingly, an intricate, deconstructed cassoulet. Again, Micah tastes them all in turn without giving anything away, and again we fight for his leftovers. Finally, it's time for the verdicts. First, the results of the Cocktail Challenge. The two cocktails are revealed as Orange & Ginger Alexander - Cognac shaken with melted chocolate and fresh cream, seasoned with ginger and orange served straight up with a dust of dark chocolate; and Moth Flower - Black Moth Truffle Vodka, crème de mure, Noilly Prat dry vermouth and a touch of lavender eaux de vie shaken with fresh lemon and sugar, served straight up with violet foam. The lovely Jen from Chocolate Ecstasy Tours is announced as the winner and we all cheer as she receives her prize of Riedel glassware. Next up are the results of the Chocolate Taste Test. Micah says that he obviously needs to make it easier as nobody got the dark chocolate and there was only one person close to the white. He says the dark ganache contains coriander and coriander seeds, and I realise that I was right to think it tasted like Hoegaarden, but missed the point - a quick Google says that the citrus notes in their beer come from coriander seeds and not from oranges (though orange peel is an ingredient). As for the white chocolate, it contained white tea, lime and vanilla - and a big grin breaks over my face as I realise I must have won with my guess of green tea, lemon and vanilla. 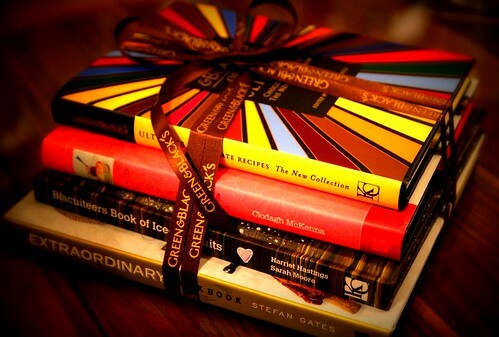 I step forward to claim my prize of a pile of gorgeous Kyle Cathie cookbooks tied with a beautiful ribbon and then melt back into the crowd. Finally, it's time for the big one - the winner of the 15:15 Challenge and the Empire Red KitchenAid. I'm not really paying attention as I'm hugging my books happily, when Micah suddenly says that the winner ... is me. 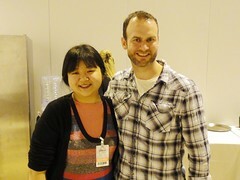 "I loved MiMi's dish because it was so well balanced, with the complexity from the shiso leaves and the salmon roe. 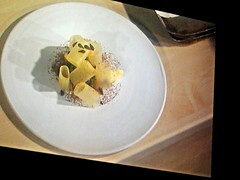 It was surprising and exciting, especially combined as a pasta dish. I was impressed that she had thought about the challenge and how she could best use the budget and time". But Laura from Feast of Scraps's fab beef dish is a very close runner-up, so she wins second prize of a £100 Japanese Knife Company voucher. This was just for fun, but if you want to become Micah's Taste Assistant for real or a member of the Green & Black's Taste Panel, you can apply at here. 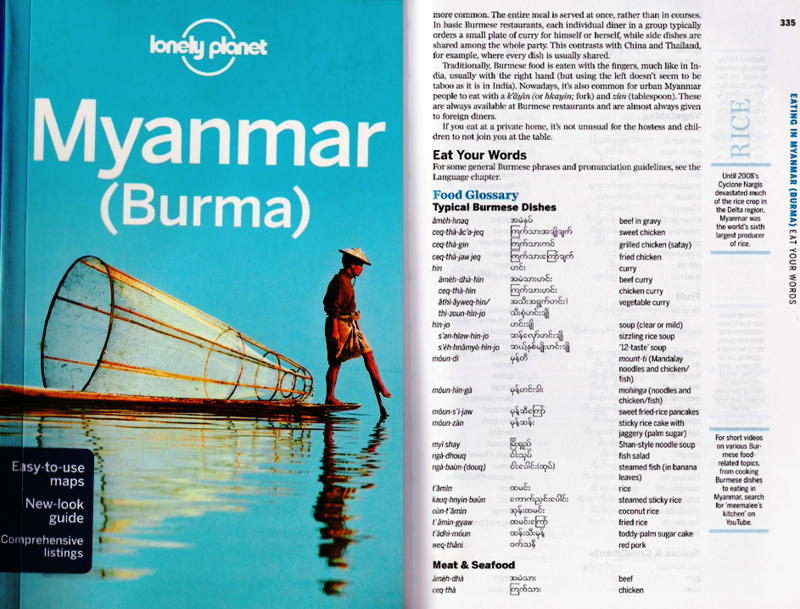 Closing date is 14 December 2010. I first heard of Rene Redzepi and his restaurant Noma early last year, as the gentleman who had won MasterChef in 2009 had undertaken one of his final challenges at Noma in Denmark. At the time, I thought Redzepi seemed a breath of fresh air, simply because he seemed kind and understated, yet at the same time joyful about food (and his looked incredible). 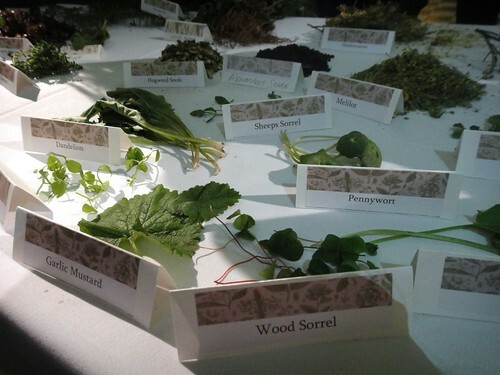 What was even more incredible was that Noma uses only food from Sweden, Norway, Iceland, Denmark and Finland, and employs a network of foragers to achieve as comprehensive a culinary canvas as possible. Right then, I decided that at the earliest opportunity I would save some pennies and visit Denmark to see for myself. 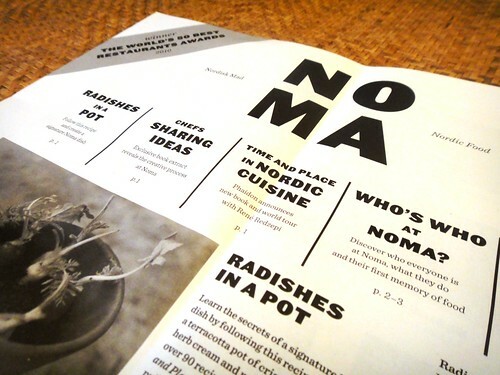 And then Redzepi's Noma was awarded first place in the World's 50 Best Restaurant Awards this year, toppling Ferran Adria's El Bulli, and I wistfully thought, "Oh, I'm never going to get to eat there now - it'll be booked up for ever". 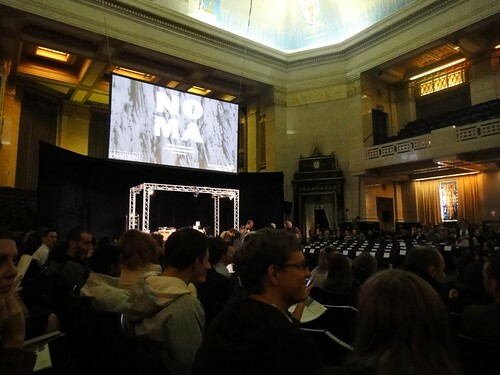 But both Noma and Rene Redzepi became a little bit more accessible, when on Friday he appeared in London as part of his tour for his first English language book "NOMA - Time and Place in Nordic Cuisine". A thousand of us gathered in Freemasons' Hall to listen to the Great Dane speak, like vacant youths to a Justin Bieber concert. 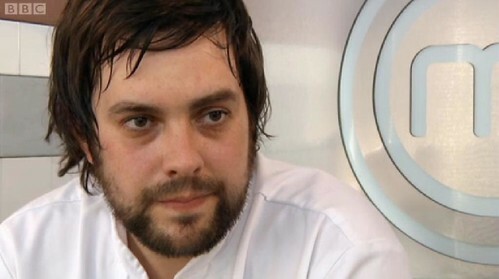 He'd brought some of his team with him including Ben Greeno to help him demo some of Noma's latest dishes, as well as his best regular - a guy called Ali who'd been there 14 times in the past year. 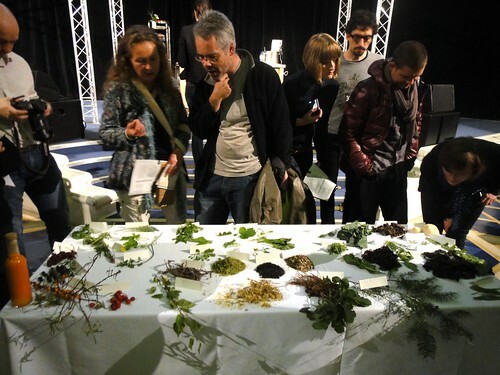 In front of the stage was a table of 41 types of locally foraged food that had been gathered by Miles Irving, which we pored over. Sealed Noma goody bags were handed out to each of us, and biodynamic carrots from Denmark were passed around for us to munch making us giddy with excitement. 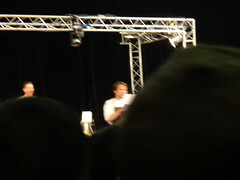 Then Redzepi began to speak and we all fell silent. That first impression I had of Redzepi being a breath of fresh air was compounded when, rather than coming on like a superstar to a fanfare (which some chefs are wont to do), he mentioned that the last time he had been here Noma had been voted Best Restaurant and then self-deprecatingly read out a complaint letter from one of his diners. Listen to the AudioBoo below. He then took us through the creative process which drives Noma - a sense of wonder and a willingness to think outside accepted conventions. For instance, in the dish Asparagus and Spruce, Redzepi noticed that spruce trees grew right next to a field of asparagus so he wondered whether they'd be equally companionable on a plate. This led him to tie asparagus spears to small spruce branches and to grill them so the spruce scent infused the asparagus and it turned out to be a happy combination. 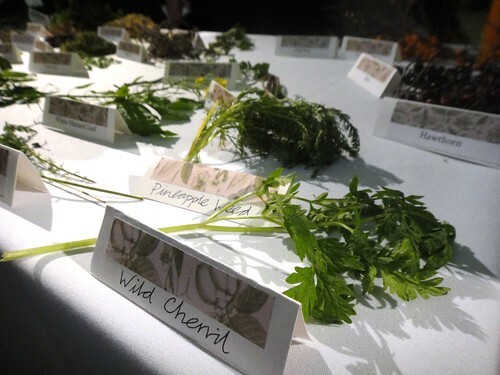 Necessity also drove Redzepi to be imaginative - in Vintage Carrot and Camomile, when fresh produce was scarce, he and his team discovered that ancient, frankly manky-looking carrots could be braised in goat's butter to become almost meatily delicious. His Sh*tty Potatoes (sic) were a similar innovation springing from a lack of decent produce - tiny, stunted potatoes which could be cooked for mere seconds so they retained their bite and then cooked with cream and a form of milk yuba to become nutty and seductive. 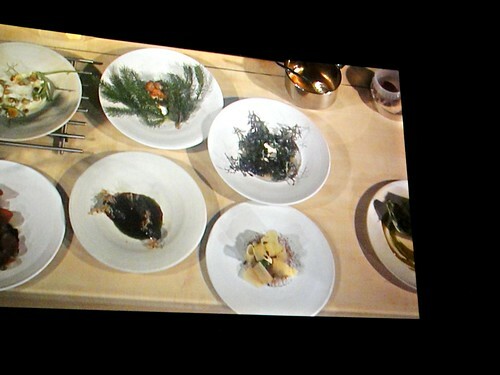 Then Redzepi prepared several of these dishes for us to see - giving commentary as the beautiful plates took shape before us. There wasn't a dish which didn't sound, smell and look mind-bogglingly good. 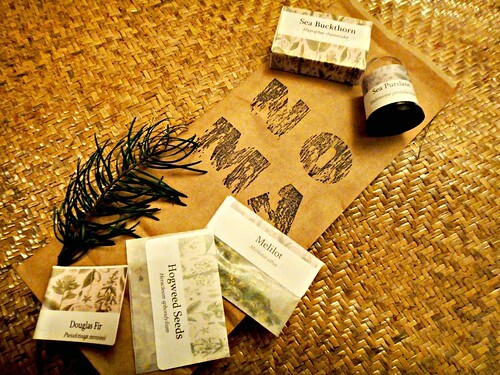 And just as we were beginning to get hungry and lustful, they began to pass round pickled rose petals for us to try (beautiful) and Redzepi asked us to open up our Noma goody bags and to try the treats inside. 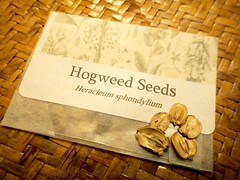 I'd had hogweed before at The Wild Garlic, so recognised its warm, peppery savouriness. The Douglas Fir was resiny as expected, but also surprisingly similar to kaffir lime leaf - astringent and citrussy. The melilot was bitter and aniseedy, the sea buckthorn sweet and sour. 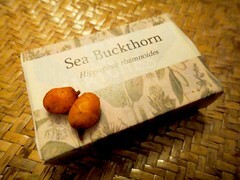 My favourite was probably the sea purslane which was a little like bladderwrack - succulent, moist and briny. Redzepi's enthusiasm was infectious - as he talked us through the different herbs and leaves, you could understand his sheer delight when, for example, he discovered a type of grass near his restaurant which tasted just like coriander, or that the service berry tastes just like tamarind - thus ensuring he could stick to his policy of local foods only whilst expanding the food he could create. 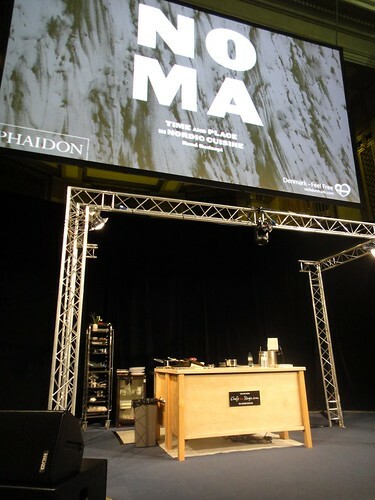 At the end of the talk, Redzepi was led off to do a book-signing for his multitude of avid fans - I on the other hand made a beeline for the stage to try to get a taste of the dishes that he'd made. Alas, the throngs were too great, though I did manage to get hold of one dried scallop sliver which was intensely umami. 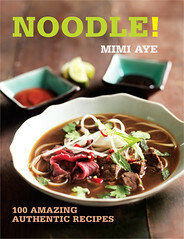 The book itself looks brilliant and is definitely on my Christmas wishlist. Whether or not I'd recreate any of the dishes, I cannot say, but I think it's worth buying for a piece of genuine, innocent genius. 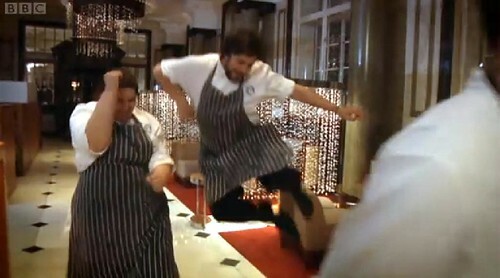 FACT – I watched about 4 episodes of MasterChef the Professionals this year (including the one with "39 Year Old Lee" and the one where cocky Kevin threw a wobbly). FACT – That means I’m probably not qualified to review it. FACT – That’s not going to stop me. 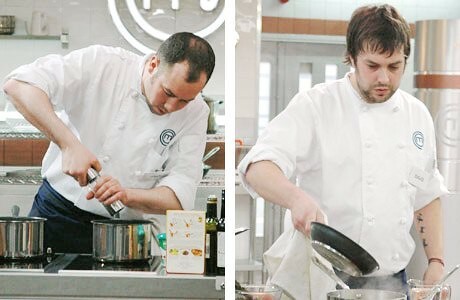 Our three finalists are Claire Lara, a tutor at Liverpool Community College; John Calton, chef at the Duke of Wellington pub, in Newton, Northumberland and Dave Coulson, chef at the Eden Castle Inn in Hartlepool. They’re all Northern. One of them will win. Backstory time! Some kind of MOR dross (Keane?) plays as we find ourselves in Liverpool to discover that Clare grew up on a beach with a postman who fed her on oven chips. Suddenly Air plays, filling me with intense deja vu, but it all makes sense, as next she did a YTS which sent her to Paris for five years (long freaking youth training scheme), and fell for a French chef called Marc who thought her an oddball, but married her anyway. She now teaches kids in Liverpool not to steal cars. Bob Dylan heralds shots of shakey Dave walking over a red bridge. I spent ages staring at David yesterday when they made cakes for macaron king Pierre Herme, wondering who he reminded me of, and it’s finally hit me – Dehydrator Eddie, Chandler’s insane room-mate in Friends. Dave's the first person in his family not to be a coal-miner (What? Even your mum? And your granny?). As a youth, he went to football academy, but he left that and needed something to do, so he grew some facial hair. For some reason, he then tells us he’s had one girlfriend during the whole time he's been a chef. His mum says he’s fat. Smashing Pumpkins plays for John, a cross between Craig Charles and Mark Lamarr – he chucked in being an electrical engineer and then became a kitchen porter, before working his way up to chef. He says he wants to give 110% - anyone who says that should be automatically disqualified. These people are all younger than me. Anyway, their first challenge tonight is to cook for a host of chefs who between them hold over 40 Michelin stars, eg Pierre Koffman, Claire Smyth, Alain Roux, Joscelyn Herland. 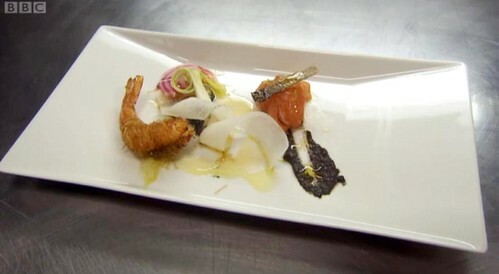 David is responsible for the starter of salmon sashimi, marinated in citrus zest, topped with a crispy salmon skin rectangle, accompanied with black sesame puree and a deep-fried tiger prawn wrapped in shoe-string *cough* kadaifa pastry, served with pickled radish and drizzled with oil. Simples. 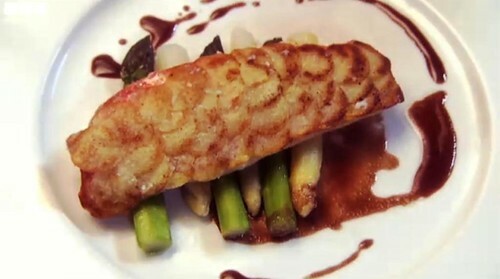 Claire is making a Paul Bocuse dish of pan-fried red mullet coated with finely sliced potato "scales", on a bed of white and green asparagus with a liver and red wine sauce. Fish and liver. Yummy. She has to scale and fillet 30 mullets, trim 180 asparagus and make 900 potato scales. Simples. 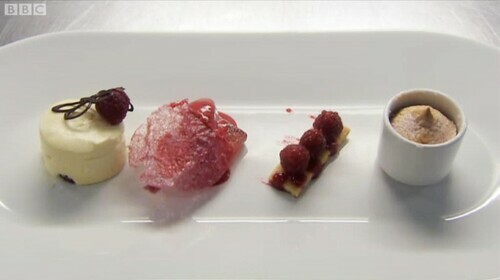 John is on dessert duty, with an assiette of framboise comprising white chocolate parfait, raspberry liqueur jelly, raspberry sorbet topped with tuille, raspberry souffle and shortbreads with raspberry coulis. Michel eyeballs John and says “You can’t afford to f*ck up". Simples. 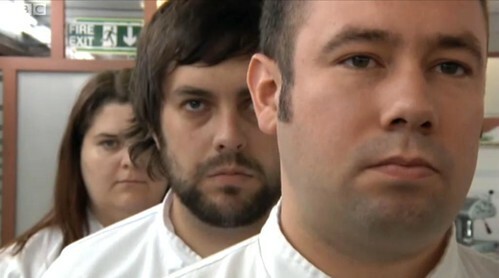 David's a bit wary "I cook leeks, man". He then tastes some dashi and opines "That is good, like. It’s weird - dunno what it tastes like, but it tastes nice, like". I’m glad that I’m the writer and he’s the chef. 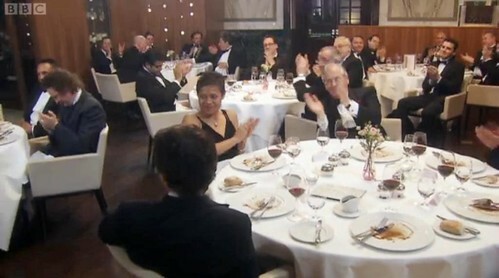 He then preps the salmon, but forgets to keep the skin and to remove the bloodline – Michel yells "Trim your loins!" and David says, “This is really, really hard, like. Like harder than any restaurant. It’s mental, like". As voiceover lady tries to make it sound like marinading a fish for TWO. AND. A. HALF. HOURS. 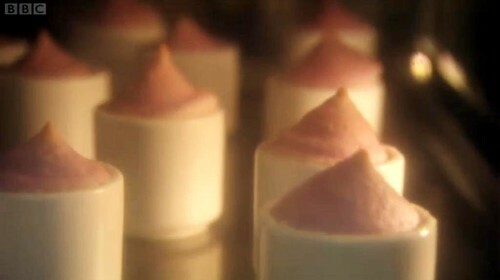 is the biggest deal in the world, David admits "I don’t really understand these ingredients. I’ve never heard of the Japanese spices. If I screw this, we’re all screwed". No, mate - you’re screwed. Meanwhile, Claire’s making potato scales, and Michel says she’s got chef’s brain, which is possibly something like housemaid’s knee. In the pastry section, John has somehow made the raspberry jelly look like it's covered in washing up liquid, and Michel says in the understatement of the year “That’s not particularly nice”. To add insult to injury, John then makes the sh!ttest raspberry tuiles known to man, and fails to understand that two shortbreads per person when there are 30 covers means 60 shortbreads and not 31. Where is Gregg? Where is Jun Tanaka? Suddenly Claire has a bit of a turn and needs to go for some air, as only 20 mullet have been prepped. Gregg (ah, there he is) reels her back in by telling her to go to her happy place and attempts to show emotion by pawing clumsily at her back. The music from the end of Trading Places (okay, it's Mozart or something) plays as the superstar chef diners begin to arrive. There's Brett Graham (The Ledbury), Olivier Limousin (L’Atelier Joel Robuchon), Helene Darroze (The Connaught), Michael Caines (Gidleigh Park - just voted top of The Sunday Times Food List), John Campbell (Coworth Park), Atul Kochhar (Benares), Andrew Fairlie, Alexis Gauthier, Philip Howard (the Square), and Martin Burge (Watley Manor). As well as chefs, there are restaurateurs David Moore (Pied a Terre and L’Autre Pied - the put-upon one from The Restaurant) and Will Smith (no, not that one, but from Arbutus and Wild Honey). Lastly there's Derek Brown and Chris Miller, ex Michelin Inspectors. Anyway, I don’t care about any of them because Monica is there. Monica! Back in the kitchen, and voiceover lady intones "DAVID has to SCRAPE the marinade off the salmon". Never has cuisine sounded so repugnant. "I’m gonna put me all into it, like" says David earnestly, and I decide I quite like him, even if he does look like he'd mug you for a Yorkie Bar. Give me your Yorkie. In return, I may dehydrate something for you. Michel says to him “You're leaving yourself very little time to dress up neatly" which seems a bit personal (though he does need a good iron). 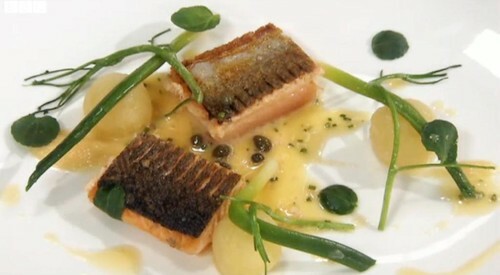 David's salmon starter goes out - what's the verdict? Alexis Gauthier says it's a bit shabby, but Pierre Koffmann give the presentation 10/10 (FIGHT! ), and Atul Kochhar give it a Thums Up (taste the thunder). 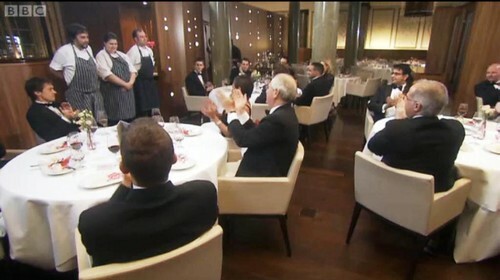 Clare Smyth says to Dave “I don’t think you could have done a better job” which seems a bit harsh. For Dave, it’s been like boxing with Pele, or playing football with Muhammed Ali. Or something. 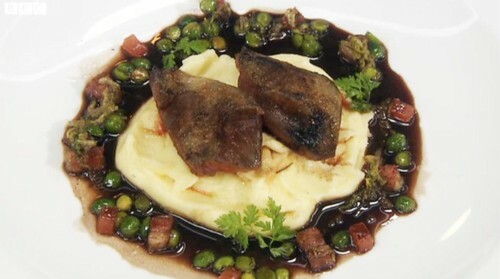 Claire's mullet is finally ready, and the chefs tuck in - Pierre Koffmann says the green asparagus is undercooked, and there's not enough sauce, but Tom Kitchin and Claire Smyth say she's nailed it. Jean Christopher Ansany-Alex from L’Auberge de l’Ile says "it’s perfectable - is that a word?" and it's not, but I don't mind, as I'm bathing in his treacly Frenchy-French accent. As for Claire herself – she’s over the moon, and weirdly they seem to be playing the love theme from Indiana Jones. 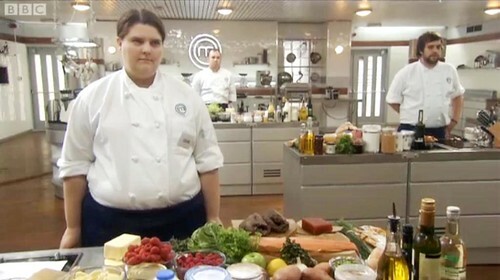 Meanwhile, John has been in the pastry kitchen, so has to bring all the puds back to the main kitchen in a service lift. I’m feeling quite teary with empathy at this moment, as I remember staggering with stockpots down the stairs at the Wild Garlic (no, I'm not f*cking going on MasterChef for real). He attempts to blowtorch off the scum from the jelly, and then Michel cusses him for having puds that slide around and tells him to fix them with jam. "Top shelf" says John, and all I can think of is nudie mags, but alas he's referring to the souffles. “My tuile is a bit soft, guys” says Michael Caines, and no-one knows where to look, which is a bit unsympathetic, as it's a common problem for men his age. Comments come in - "No howlers", "Very, very good attempt", "A lot to deliver", "Glad it wasn’t us". “It’s been a good day” says John. The sad music (and comments) think otherwise. 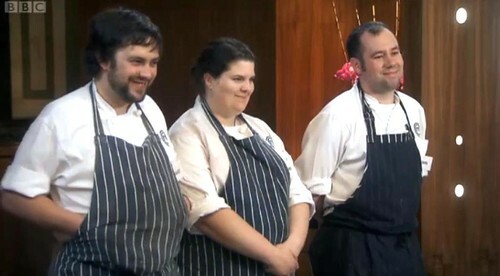 John, David and Claire are brought in to see the chefs one last time. Alexis Gauthier says lovely things with that lovely smile he has. Then Monica (Monica!) tells them she’s pleased she put them through the first round (thus acknowledging the fact that it has sod all to do with Wallace). Talking of Wallace, where’s he been? Oh, there he is! A shot of Big Ben! So this means we’re back in London, having been all the way over at Pearl which is in … London. Michel winks at them coquettishly as he says "This is it, guys. Treat us today. 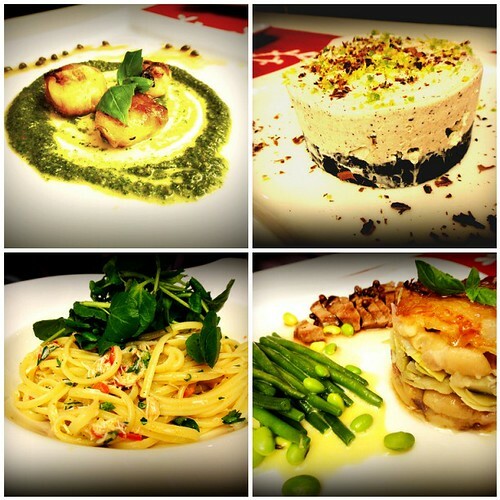 Spoil us", and the three of them start thinking of ways to incorporate Ferrero Rocher into their dishes. 2 ½ hours, 3 dishes, 1 champion. John again says he needs to put in 110 % (seriously man - if it was up to me, the first time you said it, you'd be out). I fail to pay attention to any of the cooking, though I do notice that Gregg has upgraded from merely wanting to stick his face in puddings to wanting to dip his head in them. Dark chocolate mousse, topped chocolate nougatine on a green tea financier, and milk ice cream. Michel says “Visually great” and John says “Let’s hope it tastes nice”, but this sounds less of a joke and more of a genuine concern. For John's starter, Michel says the “the lobster has a chewy edge which is nice [really? ], but the salad is a little bland” . Gregg says he likes the “metallic tang of basil” and I wonder if he's pregnant, as apparently your tastebuds play tricks on you when you're up the duff. 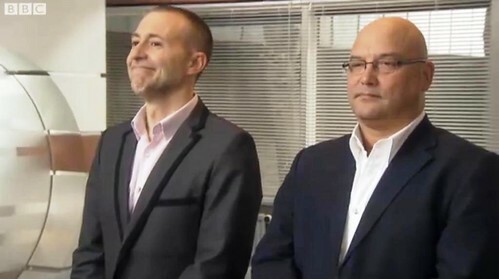 For John's main, Gregg says "Balance those up and I’ll give him a big kiss", and I cheer, as it's just not MasterChef without untoward and slightly pervy comments from Puddingface. For Michel "the presentation is bang on the ticket; it's heavenly; the turbot is slightly over, but I'll forgive you because it's glorious" . Gregg says "Corrrrr ... it's really lovely" . For John's pudding, Michel says "very indulgent and expensive ingredients" (not fancy-pants gold leaf though, was it?). John says "I want to be as good as this guy", gesturing at Michel, who replies “I’m not that good”, and he looks so deadly serious that I wonder if an owl hooted and a clock chimed in the studio at that point. 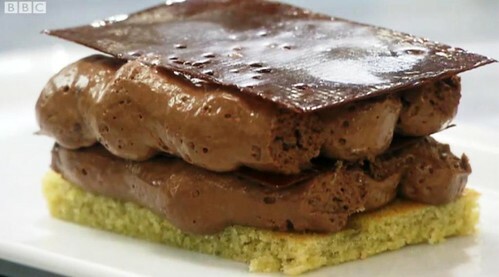 But John's dessert is "great, chocolatey, rich yet light - though one little let-down – ice cream is grainy" says Michel. For me, the let-down is that it looks like a doo-doo sandwich. 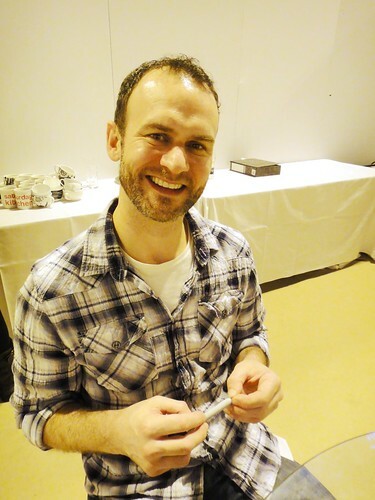 Gregg says "I think that’s absolutely lovely - despite the graininess, with chocolate of that quality I’ll sit happily with a spoon in my hand all day" - but then how will the pud get in your mouth, Gregg? HOW? Claire's starter "works perfectly" for Michel, but Gregg is slightly less enamoured as the apple "though not unpleasant, is a big wash of sweet juice which takes away from the sweetness, but that wouldn’t stop me really enjoying it". I'm not sure anything would, Gregg. 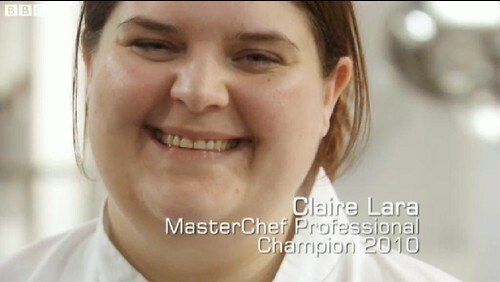 As for Claire's main, it's making Michel salivate with its "lovely crisp skin, rich, deep, quite simply delicious" . Gregg says "Oh my word, that’s brilliant – the sort of dish the waiter tries to take away and you’re still picking with your fingers". Shudder. Claire's pudding for Michel is "Neat, precise and classy. Damn good. I would definitely, definitely wipe the plate clean". Gregg just says "Lovely, lovely, lovely", and I'm relieved that he's spared me another gruesome mental image. 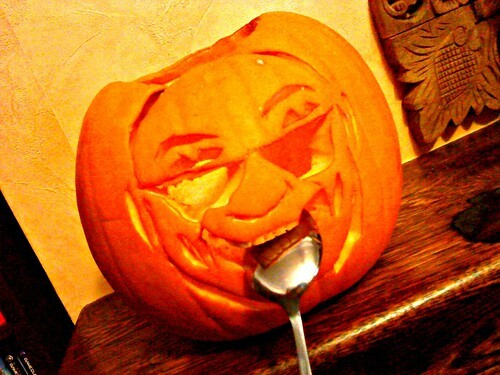 David says "I’ve used my imagination on this. It’s pretty cool, like" in an accent so lazily Scouse Ringo Starr that all I can think of is Thomas the Tank Engine. He then says he wants to give the judges something to really think about, which sounds more like a threat than a promise. Hot chocolate mousse on top of rice crispy cake, with a cherry sorbet and cherries soaked in kirsch. 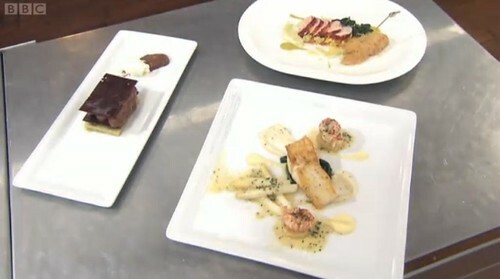 Re David's starter, Michel says it's "very clever, very good seasoning. Works well, very well in fact". Gregg says it "tastes good - leaves me wanting more, but maybe the main is the 'more' I’m after". I'm idly wondering where I've had mackerel tartare before, and realise it's the Ship pub in Wandsworth, where it was bloody good. David's pie is next - Michel says "Wow, I’ve never seen that before. This guy’s got imagination. It’s fun. I love it when that happens. It’s a clever dish. And I want a plateful of those wings". 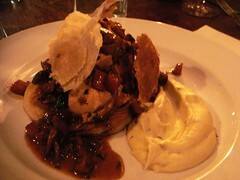 Gregg says "Cor, I think that pie is lovely - the meaty strong morels match the chicken". I'm idly wondering where I've had deconstructed chicken and mushroom pie before, and realise it's ... the Ship pub in Wandsworth, where it was bloody good. And now I'm a bit scared. 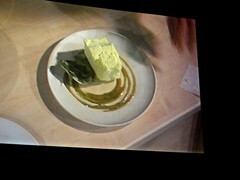 Lastly, it's David's pudding - Michel says it "has to be very, very tasty to make up for the poor visual aspect". But "the mousse is rich, intense as it should be. 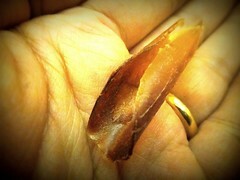 You removed the stones, but replaced the stalks which is craftmanship. And the chocolate crispies at the bottom are chocolate crispies". This last comment seems least helpful. Gregg says something. I've lost interest. Our three heroes are then sent away, whilst Michel and Gregg begin to deliberate. "John picked the right day to get it together, he's grown and taken everything on board" . 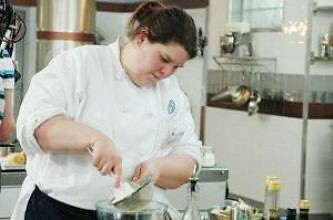 "Claire’s food was stunning, delicate, elegant, but with depth of taste – she's a class act". "David’s forte is delivering great taste in abundance" . "All three have immense potential - I love all three of them so much - where do you draw the line?" (I would say inappropriate touching is where you draw the line, Michel). John, David and Claire are brought back into the room for one last time and "With or Without You" plays for no apparent reason other than to give Bono some royalties. Where is Take That? I demand some Take That. Michel announces Claire as the winner, and I'm quietly smug that I've backed the winning horse since 2005. 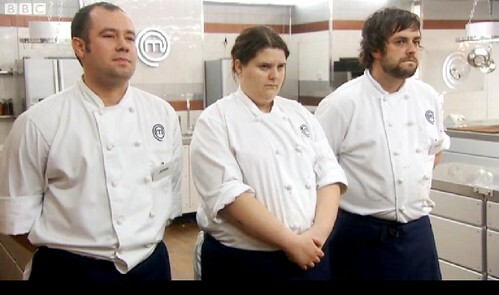 Although never have I cared so little about a MasterChef final. Apart from Celebrity MasterChef. But then I've never bothered watching that.